Now Create Animated Spokesperson Video in Just 30 Seconds with Full Customization up to 2 Male & 2 Female Characters. 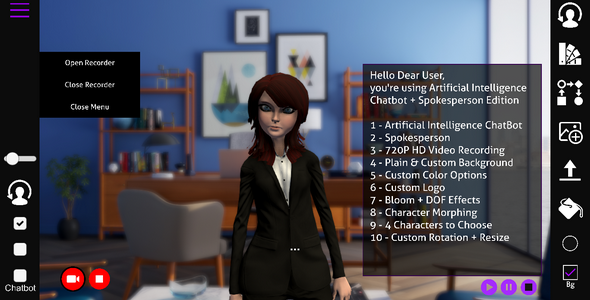 or do a chat with AIML Artificial Intelligence with the same characters in one click. We’re Using AIML Technology for The Chatbot Mode (AIML, or Artificial Intelligence Markup Language, is an XML dialect for creating natural language software agents.) The Best Opportunity for Developers. or You Can Create Story Teller Character videos for presentations or Whatever You Want.